Heads up: This week is a bit of a departure from your "normal" schedule! Please review the following information carefully, keep your planner up-to-date each day, and refer to the classroom calendar for clarification. Monday and Tuesday you will take the second administration of the MAP assessment. We will use the results to plan math lessons for the second half of the school year. It is important that you are working towards a score of 219 (the end-of-the-year benchmark). While you will have homework and TenMarks assignments, you will NOT have a quiz this week. Your homework will be given TUESDAY and WEDNESDAY evening, and will be due the following day. We will wrap up our studies on Earth's water with a culminating activity that will allow you to be creative with art or words! 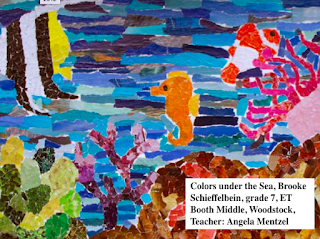 The River of Words program invites students in Georgia to create a poem or piece of art that is inspired by water. This is an excellent way to reflect upon your water research and share what you learned in a novel way! Be sure to check out the "River of Words" shelf for examples of what students have done over the past three years. Perhaps YOUR creation will be published in 2017! You will work on your creation during work time this week. Your submission is due Friday. Click the picture below to see galleries of previously published work. Term 2 is coming to an end on December 20th. I've created another "I Can" booklet that you can use to review all of the "I Can" statements we've had over the past nine weeks. As you finish up your River of Words submission, feel free to complete the booklet. While not a required activity, if you complete and check it by December 20th, I will give you an automatic 100% test grade in both math and science! Finally, please be sure to submit your signed permission form and $5 to attend the field trip to the Mighty 8th Air-force Museum. The form and payment are due Wednesday, December 14. We will visit the museum Monday, December 19.